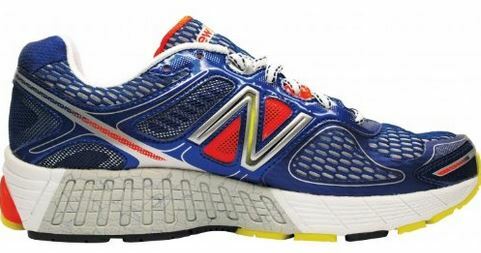 The New Balance 860 is a line that has been around for quite a while, but New Balance recently changed their numbering system. The 860V4 is the fourth version of the 860 since that time. The name will always be 860 with a new version number each year, making it much less complicated to follow the line of shoes from one year to the next. If you look at the name of the shoe on a shoe box, however, it will still be a little confusing. If you are buying the silver and blue color of the men’s 860V4 the name on the box will actually be “M860SB4,” with the M standing for “men’s” and the SB standing for the color, in this case silver and blue. The 4 on the end refers to the version number. The 860 line is being positioned as a competitor to the Brooks “Adrenaline” and the Asics “GT-2000,” and it definitely fits in that category. It doesn’t use any gel pad cushioning like its main competitors, opting instead for a version of EVA foam the length of the shoe with a softer foam called “Abzorb” concentrated under the heel and spreading out into a thin layer under the forefoot. This is a moderate stability shoe that has a slightly firmer midsole than its main competition. The 860 line has not gone through any dramatic changes over the past few years. The only tweaks from version three to version four are a different layout of the outsole rubber and more of the Abzorb material – last year it was only under the heel, now there is more under the heel and up the length of the shoe. I must say that the fit of this shoe confused me a little bit. In this model I actually went down a half size and up a width compared to the size that I usually wear in this shoe. I am generally on the border line between a standard-width and wide-width shoe anyway, but in the past I have been fine with a standard width in the 860’s. My main trouble area in the toes. I believe that it is not so much the width of the toes that was the problem in the standard width, but rather the depth. The upper was a closer fit that I was accustomed to and it did not give me as much space to move my toes around as I prefer. Going up to a wide width solved that. The underfoot feel of this shoe is very interesting. I was very worried when I walked around in the shoe before running because it felt (and sounded) very clunky, especially in the heel. It was difficult to walk in these without making a clomping sound. Running in the shoe, however, was pleasantly surprising. The heel of the shoe was less clunky and more cushioned than I expected. It actually felt like there were little trampolines under my heels\. The forefoot of the shoes is more firm and stiff than other comparable models like the Adrenaline or GT-2000. This is good if you like a responsive shoe that gives you a solid feel for the road as you push off. The transition from heel to forefoot was just fine – I never noticed it or thought about it, which is a good thing. There are no gel pads in this shoe, or anything else to potentially cause problems during the transition, so it is quite a smooth ride. I have always had good luck with the durability of my New Balance shoes, and the 860V4 is no different. After several runs you can not even tell that the outsole of the shoe has been used outside – there is no noticeable wear. The upper is holding up well with no tears in the mesh or seams coming undone. Historically I have been able to get above-average mileage out of the New Balance 860 line, which for me is about 450-500 miles. My initial impression of the 860V4 is that it will be more of the same in this department. If you are looking for a lightweight, flexible shoe the 860V4 is probably not for you. If you prefer an everyday training shoe with great cushion under the heel, very responsive forefoot cushioning, and moderate stability I would definitely take a look at the New Balance 860V4. This shoe is an especially great fit for those who are moderate heel strikers and those who are looking for a slightly firmer alternative to the Brooks Adrenaline or Asics GT-2000 lines. This entry was posted in New Balance, Running Shoes and tagged New Balance 860V4 Running Shoe.